cawood's blog - geek literature: halo 2 hacks is out! halo 2 hacks is out! Note: this book has nothing to do with cheating on Xbox Live - don't buy it if that's what you expect to find. the book covers tricks, glitches and easter eggs. the only modding discussed in the book is the positive and creative kind. refer to my post Halo Modding Considered Harmful? for more info. 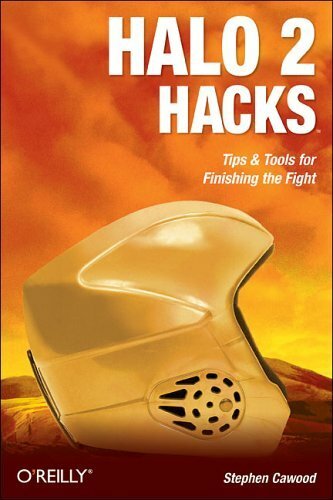 Halo 2 Hacks is available for your buying pleasure. the book should be on your local bookstore shelves in the near future. you can check out some sample hacks on the o'reily hacks series site. o'reilly sent me a copy and I'm thrilled with their work - they did a great job on the book. this project only served to reinforce my opinion that o'reilly is a first-class publishing house that boasts quality editors and other staff. this is the same project that I discussed in these interviews: MTV 969 interview and Urban Rush interview. You sir are a God in my eyes. You are the person who got me into modding. I saw this book at my local Barns and Noble and picked it up immediately. Thank you for this book. Sadly Halo 3 is out and modding has died out. Maybe one day when we can finally crack the encryption key Bungie uses to resign their Halo 3 maps. The modding community will rise again.